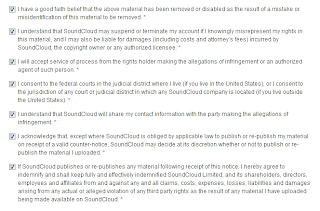 just how bad is soundcloud's "automatic content protection system"? i repeat: every sound in my song is taken from sonified data. no drum machines, drum samples, or any other instruments were used. but somehow my song still triggered an automatic takedown for uncleared sampling. i didn't even run any audio effects on the samples—they are all clean. want to hear for yourself? here is my song (warning: fairly abrasive). and here is the song they think i sampled (warning: fairly mediocre). no human who listened to these two recordings would think they had anything in common. as a glitch artist/musician, i find this fascinating. what could this algorithm be hearing in my song to make it think i sampled some house track? in terms of tone, timbre, tempo, and meter, these two recordings could hardly be more dissimilar. but to a bot, they apparently sound alike. somewhere in there, indiscernible to mere human hearing, the two must have some tonal sweep or polyrhythm in common. or some checksum came up with the same result by chance. it's hard to even speculate about how this may have happened without knowing more about how their bot works. 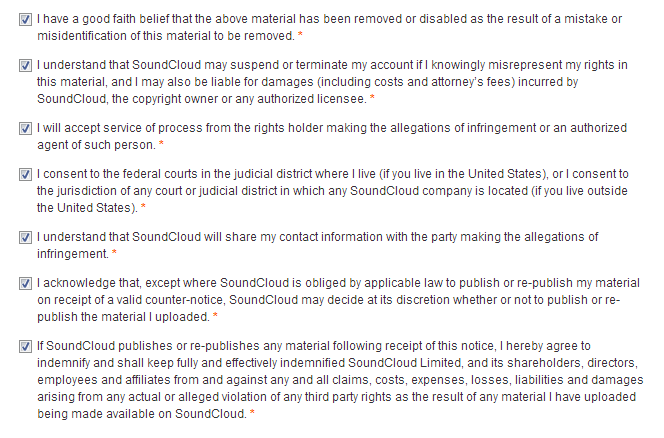 of course, there's no way for me to take soundcloud to court for wasting my time or for issuing bogus threats. all this because of a poorly programmed bot. in a way i'm lucky that my song obviously doesn't contain any "musical" samples of any sort. what would happen if i had made some housey track that just happened to use the same drum hits, or just sounded similar? This notification is to inform you that your upload has been released to your account.